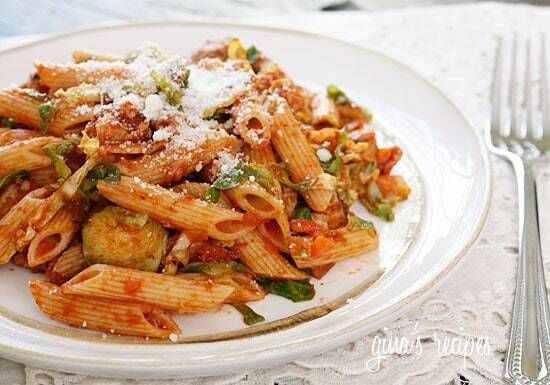 Penne pasta tossed with sauteed brussels sprouts and a quick meat ragu using lean ground turkey and just enough hot Italian pork sausage to enhance the flavor of the sauce. A hearty pasta dish for a crisp Autumn day. 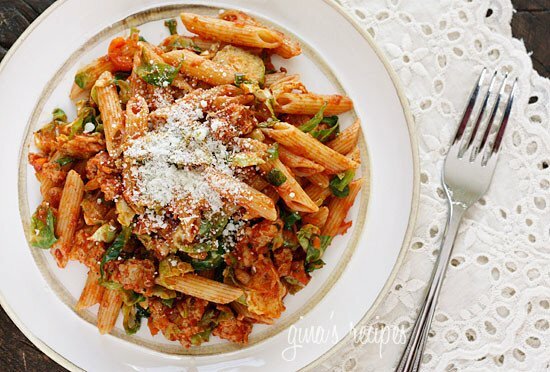 A few other pasta dishes you may like are Pasta with Butternut Squash Sauce, Spicy Sausage and Baby Spinach, Fettuccini with Winter Greens and Poached Egg, and Spicy Whole Wheat Linguini with Peppers and Spicy Sausage. I’m busy working on my cookbook, so I thought since I’m making this tonight, I would revive it from the archives. Trust me it’s good, and if you don’t believe me read the comments! I know what some of you are thinking, brussels sprouts??? Trust me on this, prepared right, they are delicious! In fact, all throughout the meal, he raved about what a great dish this turned out to be. 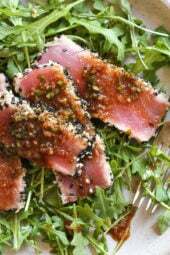 Serve this with Pecorino Romano sprinkled on top and spoonful of part-skim ricotta on top, yum!! In a large, wide skillet, add sausage and turkey over medium-high heat, breaking up the sausage and turkey as it cooks into small pieces. When completely cooked through; set aside in a bowl. 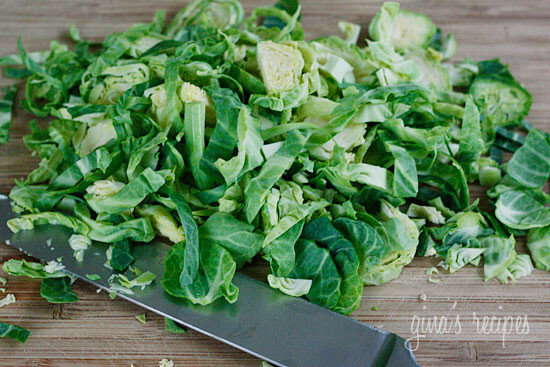 With a sharp knife, cut the brussels sprouts into thin shreds. To the skillet, add 2 tsp of oil over medium heat. When hot, add the garlic and cook until golden (do not burn). 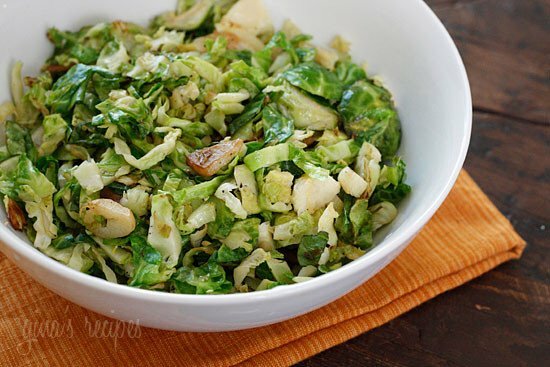 Add shredded brussels sprouts, salt and pepper and sauté until tender crisp, about 4 to 5 minutes; set aside in another bowl. To the same skillet, add remaining 2 tsp of oil over medium-high heat. 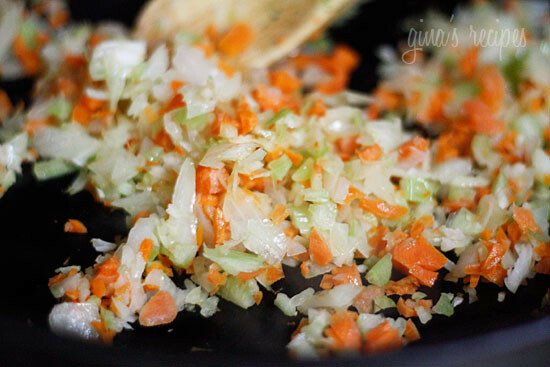 Add onion, carrot and celery, stirring well to coat with oil. Cook, stirring occasionally, until the vegetables turn golden brown, about 10 to 12 minutes. 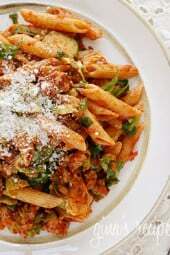 Add crushed tomatoes, sausage and turkey, bay leaf, crushed red pepper, salt and fresh pepper to taste. 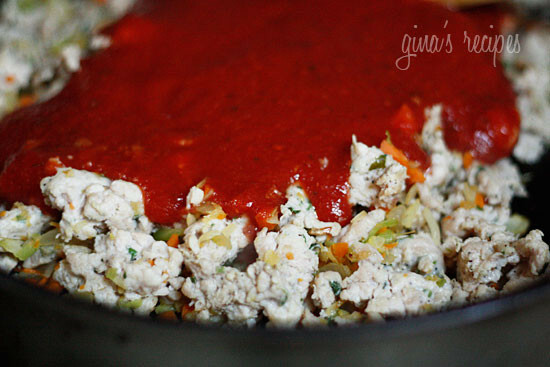 Reduce heat to low, cover and simmer about 30 – 40 minutes, or until sauce thickens. Meanwhile, while sauce is simmering, put a large pot of salted water to boil for the pasta. Add the pasta to the water 10 minutes before the sauce is done and cook pasta al dente. 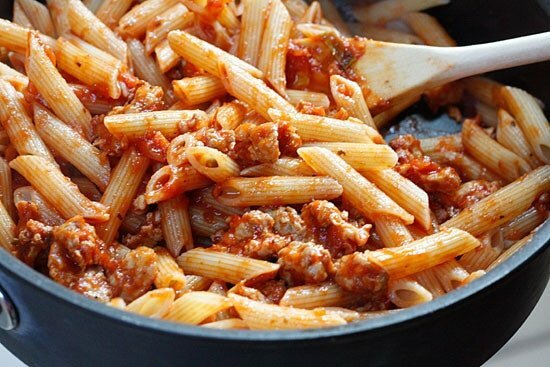 Drain and add the pasta to the skillet and toss with the sauce. 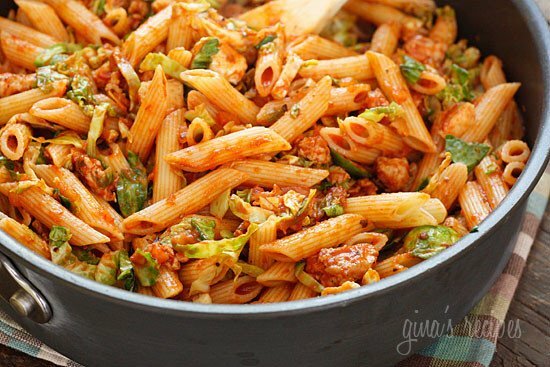 Add cooked brussel sprouts, toss and place in a large pasta bowl. 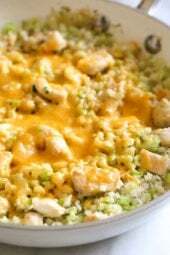 Skillet Cheesy Chicken and Veggie "Rice"
The sauce turned out great. I don’t usually make tomato sauce from scratch on a weeknight. I did, however, doctor it up a bit. I added more garlic after I sauteed the onion mix. I also added about 1 tbs italian seasoning and 1 tbs of a pizza seasoning I have (it has fennel and other good stuff in it). My husband couldn’t be persuaded to eat the brussels sprouts, but that’s fine – I put them in my bowl first with some sauce. Then I mixed the pasta with the rest of the sauce. I served my pasta over my sprouts; he had just pasta. First let me say, as a family we’ve made at least 200 of your recipes and have loved everyone one of them except maybe one or two at most. With that being said this recipe was the worst of the heap in my opinion. I do not believe turkey lends itself well to a bolognese, it is better suited for recipes that are creamier or have fat added from other sources. I would definitely not recommend this recipe to anyone. With that being said, I do want to thank you for all the other delicious meals I have enjoyed because of you! I just finished making this recipe!! Yummy. I did add some red wine to sauce and when pasta was done a 1/2 c cooked pasta water. I love how you brought in the sprouts! Such a blending of flavors! A dish well worthy of cooking! I love Brussel Sprouts and this has taken it to the next level! Thank you! Listen to Faith Middleton yesterday and you were on. Good show and job. Made this last night – right smack in the middle of a hot Texas summer and it was very, very good. Everyone in my family enjoyed it. I used my food processor to medium shred the sprouts and I added a little chicken broth to the sauce to thin it out a bit and get through the 30 min simmer. Keeper. I'm recently obsessed with brussel sprouts! This looks like a hearty winter meal. Thanks for the recipe. Big brussel sprout stalks were on sale at the grocery store, so I made this for dinner tonight. It was delicious! I started out with the idea that I was going to half the recipe, but quickly went to winging it. I decided that I wanted a lot of veggies and sauce, but not so many noodles, so I used a ton of brussel sprouts (probably more than you used for the full recipe), and about 6 oz italian pork sausage (no turkey). I coarsely diced one full carrot and a full celery stick, but just half an onion. At the end, I cooked up about 3 oz of noodles and put them in too. The end result was a veggie-lover's dream: tons of roughage with a little bit of carbs and some meat to round it out. It wasn't the quickest meal because of all the chopping and simmering, but I still have half a brussel sprout stalk and I'm making it again in a few days. It was worth every second of prep! Do you think I could make this and freeze it? I have been following your blog for several months now, and I have never been disappointed! I love all the ingredients listed; however, this recipe fell short of expectations. I found the ragu bland. I know I enjoy more heavily seasoned food, so I blame myself for not trusting my gut and adding something to the sauce. I doubled the bay leaf and the crushed red pepper, but it was still bland. I'd like to try again, but I would probably add some other spices such as basil and oregano. Oh my goodness I tried this and loved it! Only thing I did was added mushrooms with the onion, celery and carrot. It was so good. Thank you so much! This looks so good. But where do you get the sauce from. Does it come from the crushed tomatoes? This recipe is SO delicious! I would change nothing. It's awesome. 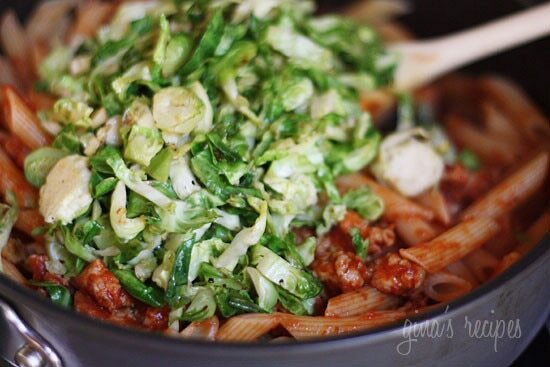 I will never make bolognese without brussel sprouts ever, ever again! LOVE, LOVE, LOVE this recipe! 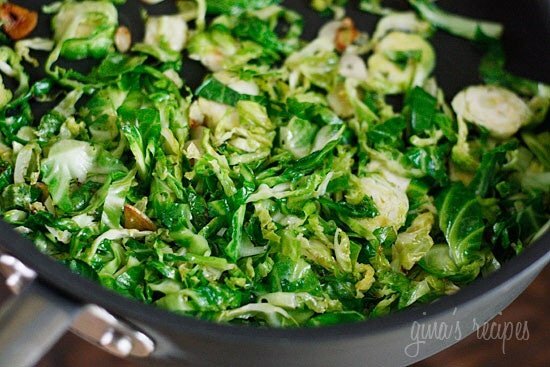 I was so amazed at how the brussel sprouts add so much flavor to this tastey dish. My family said they would order this in a restaurant! I will make this again. 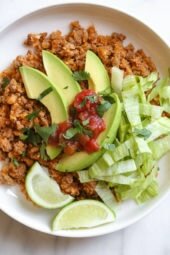 (My first time using ground turkey EVER and I will buy that again.) Thanks!